Sumitomo Demag is the company responsible for the brands of Sumitomo, Demag, Van Dorn and Newbury equipment. 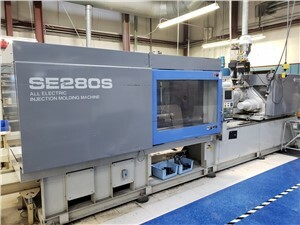 Sumitomo Demag manufacturers all-electric machines (up to 935 tons) for high-speed thin-wall/packaging, vertical, insert and 2-shot machines, hybrid machines (up to 840 tons) for thin-wall/packaging and closure machines and high-performance hydraulic machines (up to 2250 tons). It is one of the largest manufacturers of injection molders in the world. In 2014, Sumitomo Plastics Machinery LLC merged with Van Dorn Demag Corp.